Custom made Rolex Datejust Stainless Steel and 18k gold cuff links. 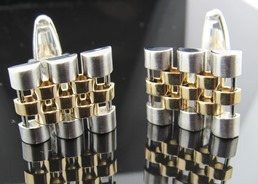 These were created when a customer of ours used his old Rolex watch bracelet to create cuff links for his two son's. Very special. 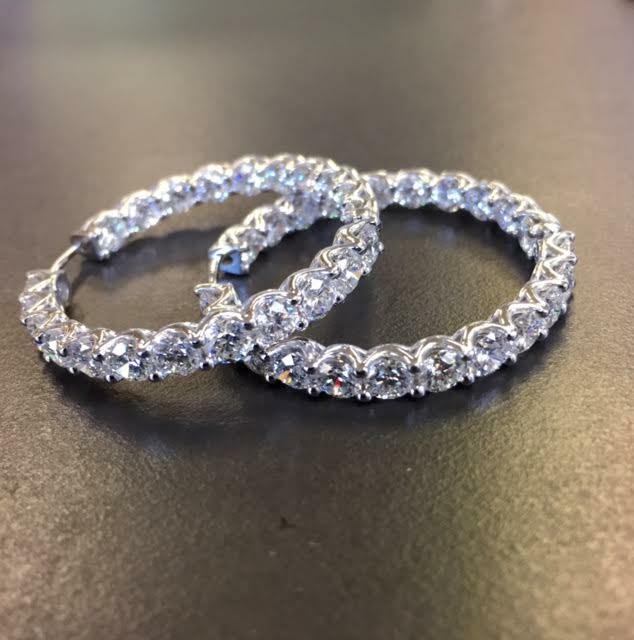 Pair of 5ctw Round Brilliant Diamond Eternity Bands. Shared prong design, F color, VS1 clarity. Platinum. Amazing custom made Opal and Diamond Necklace. 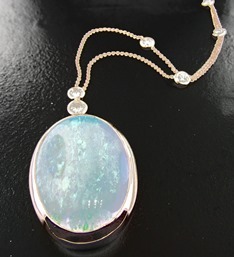 Large oval-shaped Opal is bezel set in 18k rose gold, with a custom 16-inch diamonds by the yard chain. Ferro Jewelers custom made this platinum double halo ring. 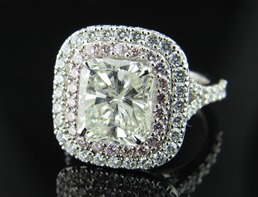 The center stone features a 3.04CT radiant cut diamond and the halos contain white and fancy pink diamonds. The ring is size 6 and in platinum. 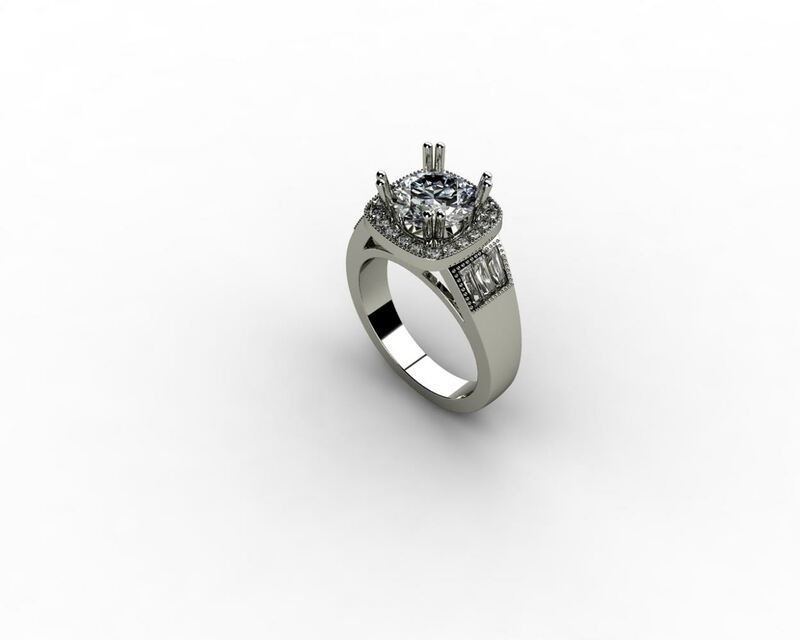 Ring may be modified to accommodate a larger center stone and finger size is adjustable. 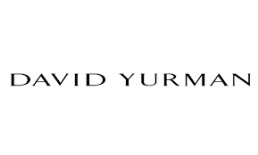 Call store for a price quote. Custom Platinum, 18K rose and yellow gold diamond stacking bands. 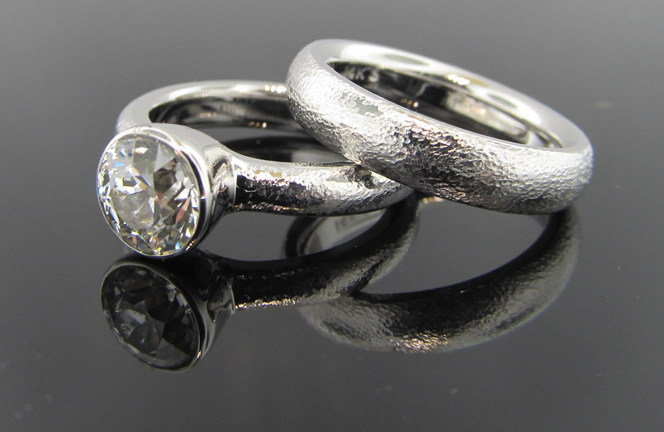 The diamonds came from the customer's old / broken rings and she recreated something new and modern. 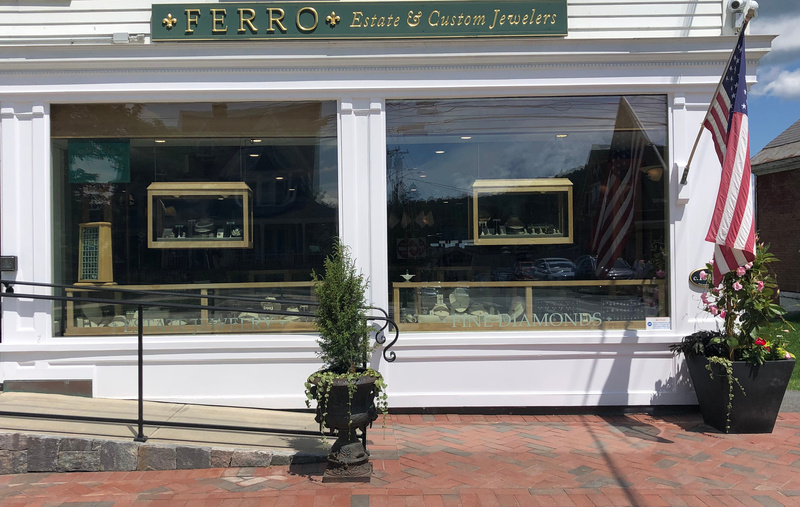 Come into Ferro Jewelers and let us create a new design for you! 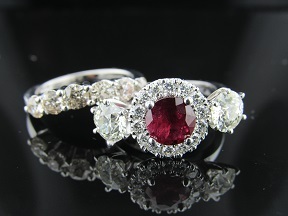 Custom three stone Ruby and Diamond ring. Three stone center is round natural ruby measuring 7.2mm x 7.27mm x 4.1mm R7/5, ruby is highlighted by a halo of 14 round brilliant cut diamonds measuring 2.1mm each with a total weight of .49ctw G-H in color and VS2-SI1, two Old European cut diamond measuring 6.3mm x 6.4mm x 4mm & 6.2mm x 6.24mm x 4mm; set in 14kt White gold weighing 4.1dwt. 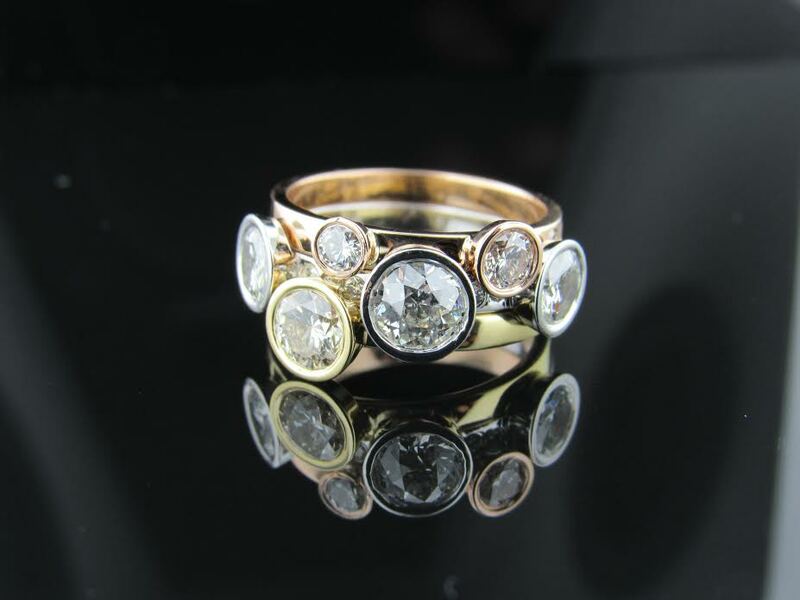 Ferro Jewelers designed this multi piece 18K ring - the pieces fit together like a puzzle. Very complex. Hi-tech, black, half-matte finish. 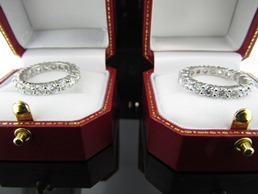 One Old European Cut diamond measuring 6.94 – 7.11 x 4.70 mm and weighing approximately 1.45 carat set in custom made 14k white gold hammered mounting. 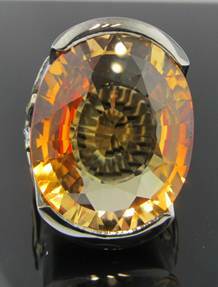 Diamond is set in a conical bezel. Match hammered band in 14k white gold measures 4mm and is a half round comfort fit. Please call store for price. Ferro Jewelers custom designed this beautiful round diamond and triple baguette diamond engagement ring using customer's stones. Center diamond was recut from a 2.44ct to 2.24ct. 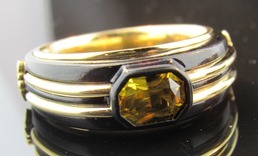 Ferro Jewelers designed this 18K yellow gold and black rhodium plated cocktail ring with a 22.5mm x 18.5mm yellow sapphire. There are five full cut champagne diamonds on each shoulder set in three dimensional 18K yellow gold strips.